I went to see the remake of Dark Shadows in the theater opening weekend and then caught it a second time as part of a double feature at a drive-in last weekend. I held off on writing a review initially, and sort of thought seeing it a second time might change my opinion of it - but it really didn’t. This film is a remake of the gothic soap opera (created by Dan Curtis) that ran on television from 1966 – 1971. It centers around a vampire named Barnabas Collins who is released from a coffin where he has been trapped for centuries by a witch named Angelique. He is reawakened in the year 1972 and must deal with Angelique, who is still making life miserable for the Collins family, and attempt to restore the family name in the town of Collinsport. 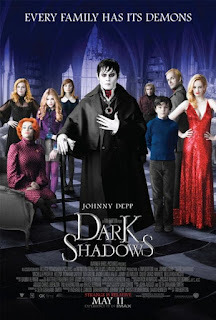 Tim Burton directed this film and it stars Johnny Depp as Barnabas Collins, Helena Bonham Carter as Dr. Julia Hoffman, Michelle Pheiffer as Elizabeth Collins and Eva Green as Angelique. It was written by Seth Grahame-Smith. My biggest complaint with Dark Shadows is the tone of the film, turning a gothic drama into a light hearted black comedy. In this version Barnabas Collins is reduced to a two-dimensional character that too often serves only as a punch line to lame jokes. There is a trend in cartoons and films nowadays to make father figures idiots, and Dark Shadows follows suit, with Barnabas at one point stalking a lava lamp, slowly sneaking up on this inanimate object like a cat stalking prey. At another point (that was shown in the trailer) he sees someone singing on a television screen and rips the back off the set, shouting, “Tiny songstress reveal yourself!” Barnabas is a dimwit, much like Homer Simpson or Peter Griffin. He solves every problem with brute force, and is easily manipulated. The devious mastermind of Curtis’ series is reduced to a dumb brute - It is embarrassing, especially for anyone who has watched the original series. There are moments where Barnabas is truly scary, attacking and feeding on various townsfolk. But these scenes are offset with ridiculous moments of light hearted humor, and I’m not sure whether to blame Burton or screenwriter Grahame-Smith. 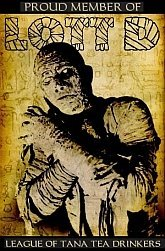 The film is obsessed with the fact that it is set in 1972, and repeatedly beats viewers over the head with this fact. It is so heavy handed here that it becomes tiresome very quickly. Ok, Knights in White Satin is playing, it is the seventies. Got it. Oh, hippies in a VW bus, ok, got it, seventies. Season of the Witch, right, seventies. The Carpenters – sigh, seventies. Lava lamp. Check. Bell bottoms. Check. Paisley. Check. No 70’s cliché is missed. The film is much more interested in presenting a parade of 70’s pop culture rather than telling a gothic horror story, which should be the focus. Depp’s makeup matches the script of this film in its heavy handed approach. He wears an effeminate white face makeup with obviously-airbrushed shadows spray painted on his cheekbones and dark circles painted around his eyes. A little subtlety would have gone a long way here – it looks like amateurish halloween makeup, more suited for a stage play than a film. Just comparing the two above tells it all - one serious, scary approach and one campy cartoonish one. 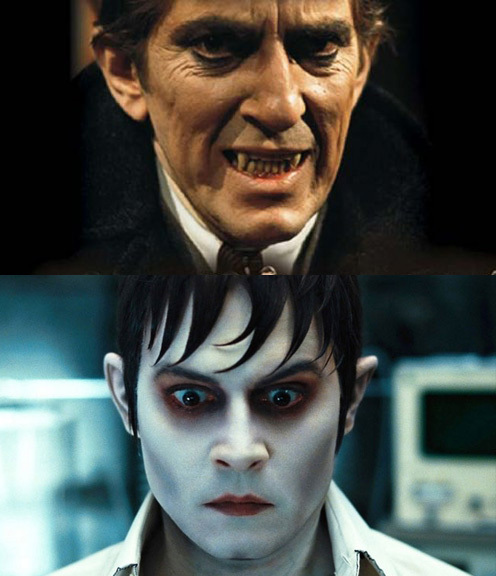 Depp does a decent job as Barnabas Collins but resembles, in this makeup especially, a boy, whereas Jonathan Frid looks like a man. It just doesn’t work, and I blame Burton’s design. Overall Dark Shadows is an uneven film, with some good things going for it, especially the opening sequence (set 200 years in the past), where Barnabas is originally cursed to become a vampire by Angelique. Honestly, this would have been a much more interesting film had it focused on THAT story. Michelle Pheiffer is terrific as the matriarch of the family, Elizabeth Collins, and Helena Bonham Carter is great as Dr. Julia Hoffman, too. In fact she was one of my favorite characters in this film. 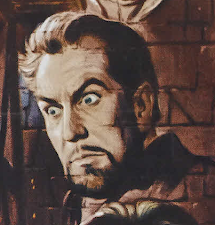 There is a cameo by Christopher Lee, who is terrific as always, and a brief appearance (very brief walk by, blink and you’ll miss it) of several original cast members including Jonathan Frid in a party scene. Alice Cooper also appears in the party scene, performing live. This was, honestly, distracting to me. 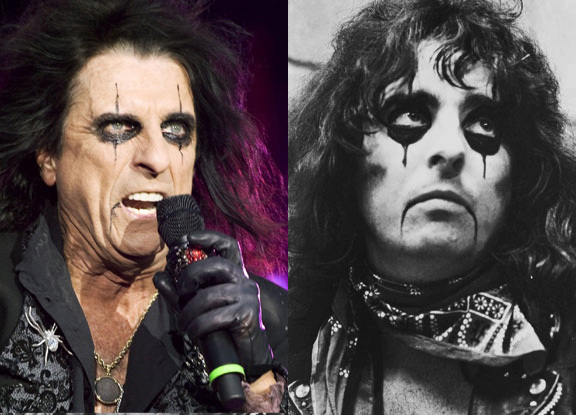 Don’t get me wrong, I am a big Alice Cooper fan, and it’s always great to see him in a movie - but as soon as he came onscreen I thought “He’s too old.” Cooper is 64 years old, and this was set in 1972 (as we are reminded CONSTANTLY). He would have been 24 at that time. I was immediately taken out of the picture at this point. It would have been much truer to the storyline if they had had an actor play a young Alice here, but Burton chose to ignore his own rules here and it just doesn’t work. For me, the number one thing to remember with a remake is to stay true to the source material. It is okay to bring your own flair or sense of storytelling style to the film, that is natural and to be expected. In fact the best remakes often bring in new elements and ideas. 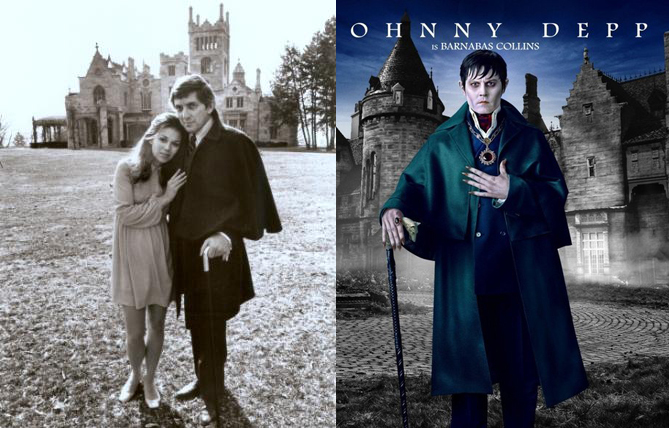 But you must still stay true to the heart of the original source material, and Dark Shadows fails in this regard. The comedic elements are not only unfaithful but downright insulting to the original series, and for that reason I can only give it mixed marks. It is, honestly, more of a parody than a remake, which is disappointing. 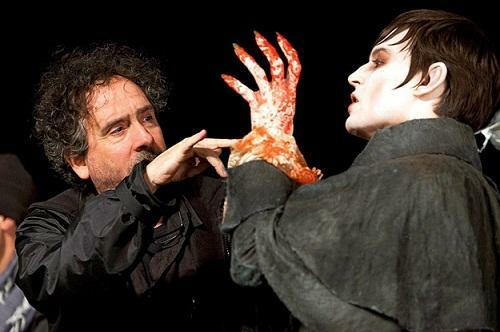 I have read repeatedly that Burton and Depp are big fans of the original series and this is their homage to it. But I find that Burton is more about Burton than anything else, and can't get over himself long enough to do this story justice. There is a good movie in here somewhere, but Burton and Grahame-Smith got so sidetracked with silly clichés and pop-culture references that they missed the mark. Very nice blog. I'm impressed. Thanks Eva, I really appreciate that! Have a great weekend! !